Solve by jacobi method : 4x-y-z=3 -2x+6y+z=9 -x+y+7z=-6? Use second iteration values to obtain thirds. Repeat, repeat. Ideal for computer though. See this video for example with more iterations. 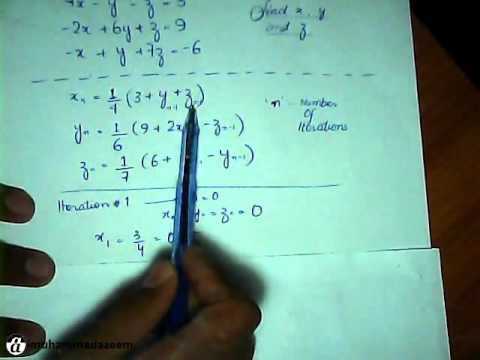 Given that log_9⁡x=alog_3⁡x find a Given that log_27⁡y=blog_3⁡y find b? Can two logarithms be multiplied? if so what would be the result please show with example...? Prove that 5i/root3-7j/root83+3k/root83 is a unit vector?